Hooray! 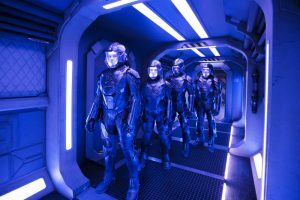 Amazon boss Jeff Bezos announced last night at the International Space Development Conference in Los Angeles that Amazon would pick up The Expanse after the show ends its current third season on SYFY, after that network announced it would not pick it up again earlier this month. Woke up this morning to the news – SYFY has elected not to pick up The Expanse for a fourth season – but that doesn’t mean it is dead just yet. We are hearing that the decision may have been due to the deal the network had for the series, only allowing first run linear rights in the U.S., as opposed to complete streaming rights as well. This makes live viewers more important, and Season 3 thus far is running around 1 million total viewers, of which 40% of that is in the 18-49 demographic, and sits it below SYFY’s other show. However, producers Alcon Entertainment are hopeful the show will go on. “We respect Syfy’s decision to end this partnership but given the commercial and critical success of the show,” said Alcon’s Andrew Kosove and Broderick Johnson in a statement. “We fully plan to pursue other opportunities for this terrific and original IP.” While this is traditionally a huge longshot for any show, my gut feeling is that they might have a better chance than most. This chops yet another space-based show from the lineup. Killjoys I believe is the sole show with Nighflyers coming up. Season 3 of SYFY’s The Expanse will premiere Wednesday, April 11 at 9/8c. Picking up immediately following the emotional and suspenseful second season finale, the 13-episode third season finds Earth, Mars and The Belt at war, with each competing entity vying for control. Now, more than ever, the mission to unlock the secret of the protomolecule reaches an all-time high and every decision made could jeopardize the survival of the solar system. The Expanse unfolds across a colonized galaxy 200 years in the future, when two strangers become unwittingly swept up in a vast conspiracy. 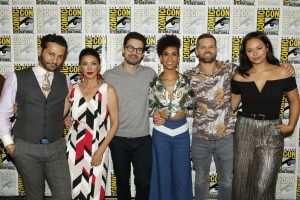 Based on the New York Times bestselling book series collectively known as “The Expanse,” written by Daniel Abraham and Ty Franck (under the pen name James S. A. Corey), the series stars Steven Strait, Shohreh Aghdashloo, Dominique Tipper, Cas Anvar, Wes Chatham and Frankie Adams. This season also introduces Elizabeth Mitchell and David Strathairn as recurring guest stars. Academy Award®-nominated screenwriting duo Mark Fergus and Hawk Ostby (Children of Men, Iron Man) serve as executive producers alongside showrunner Naren Shankar (Almost Human, Grimm). The Expanse is produced by Alcon Television Group (ATG), a division of Alcon Entertainment. 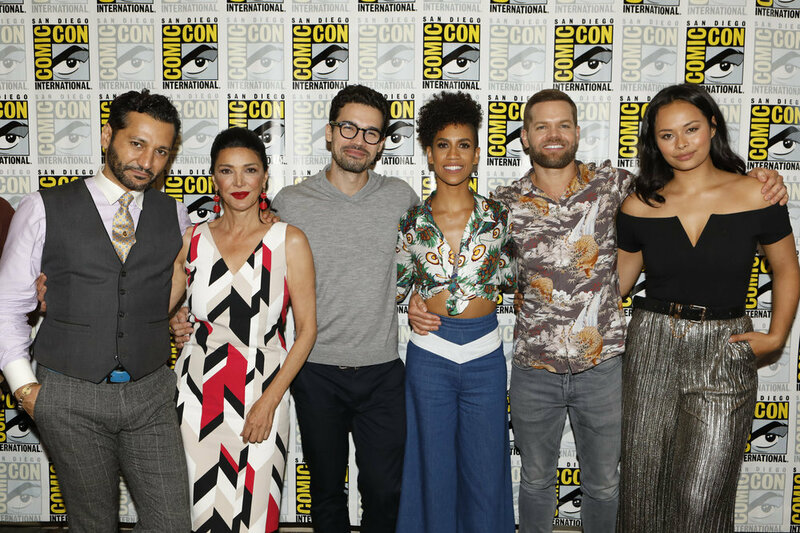 The stars of SYFY’s The Expanse attended San Diego Comic-Con to celebrate what NPR hails as the “best science fiction show in a decade.” Executive Producers Naren Shankar and Mark Fergus as well as cast members Steven Strait, Shohreh Aghdashloo, Cas Anvar, Dominique Tipper, Wes Chatham and Frankie Adams discussed Season 2’s most shocking moments and gave fans an inside look at what to expect from Season 3. In addition, they announced Elizabeth Mitchell (Lost, Revolution) joining the cast in a recurring role in Season 3. New episodes from Alcon Television Group will return to SYFY in 2018. Syfy today announced a Season 3 pickup of The Expanse, the drama series called the “best sci-fi show on TV” by io9 and recognized for “transforming TV” by Wired. The 13-episode third season will premiere on Syfy in 2018. From Alcon Television Group, The Expanse is currently airing new Season 2 episodes every Wednesday at 10/9c on Syfy. The Expanse unfolds across a colonized galaxy 200 years in the future, when two strangers become unwittingly swept up in a vast conspiracy. Based on the New York Times bestselling book series collectively known as “The Expanse,” written by Daniel Abraham and Ty Franck (under the pen name James S. A. Corey), The Expanse stars Steven Strait, Shohreh Aghdashloo, Dominique Tipper, Cas Anvar, Wes Chatham and Frankie Adams. Academy Award®-nominated screenwriting duo Mark Fergus and Hawk Ostby (Children of Men, Iron Man) serve as executive producers and showrunners, alongside Naren Shankar (CSI, Farscape). The Expanse is financed and produced by Alcon Television Group (ATG), a division of Alcon Entertainment. Like with The Magicians, Syfy’s The Expanse was one of the programs I was looking forward the most to returning. 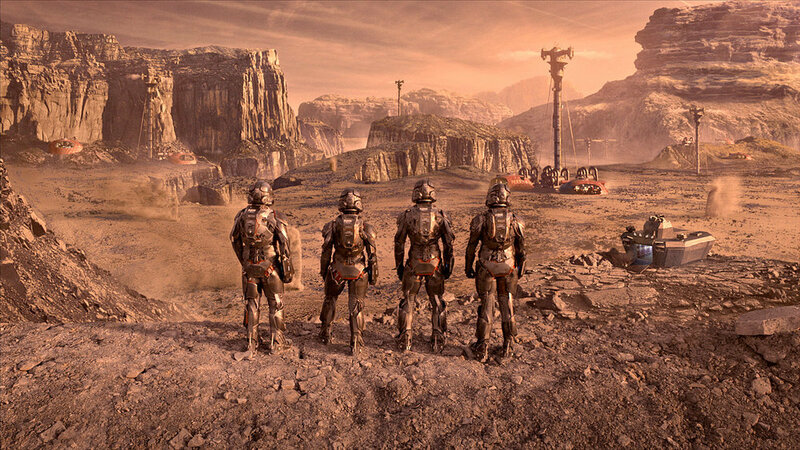 The gritty, realistic portrayal of semi-near-future space travel, along with the issues of culture and politics with Earth, Mars, and the Belt all at odds over the scarce resources was a huge draw to me. Stylistically it was a bit like the revival of Battlestar Galactica, but more grounded with known physics and seemingly more attainable future. Similarities with early set stories in Larry Niven’s Known Space, of which I know a little bit, pull me in even more. At the end of last season, the crew of the Rocinante and Ceres detective Joe Miller (Thomas Jane) tracked the disappearance of Julie Mao to the colony on Eros, where she is found, being consumed by the “protomolecule” infection, as are many others…and it seems that this infection may have been intentional. In the meantime, Earth and Mars are on the brink of war. Fear of conspiracies and terrorists and lack of resources, and the resentment of the Belt pushes each to the edge, tightening their belts at the expense of the lower classes – all while being egged on by a mysterious fourth party. We will get to see more of life on Mars and how they train, and why there are apparently a more militaristic society, providing a new setting for us to see. Who sent the protomolecule, and who is behind using it on Eros? And why? The Expanse returns to Syfy Wednesday, February 1st at 10/9c. Ahead of its second season premiere, Syfy is taking a deep dive into the world of The Expanse, the series that’s been called “the best science fiction show in a decade” by NPR. An original half-hour special titled The Expanse: Expanded and an immersive 360-degree set tour — both hosted by Adam Savage, editor in chief of Tested.com and former co-host of MythBusters – is now online at Syfy.com, and the video is also show below. The special will also air on Syfy on Wednesday, December 28 @ 11/10c. The Expanse: Expanded features exclusive interviews with the series’ cast, crew and creators, who share behind-the-scenes secrets and never-before-seen content from the acclaimed first season – lifting the curtain and revealing what it takes to build the mesmerizing worlds of Earth, Mars and the Asteroid Belt. Joining them are scientists, astronauts, journalists and loyal viewers, who explain why The Expanse is one of the most realistic and compelling visions of the future seen on television today. Additionally, when The Expanse: Expanded makes its broadcast debut on January 28, it will feature an exclusive sneak peek from the series’ highly anticipated second season. Additionally, a full 360-degree tour of the set — led by Savage and producer and “The Expanse” book series co-author Daniel Abraham — will allow fans to virtually experience the rich world of the series. Debuting in tandem with the special today on Syfy.com, the tour includes the spectacular multi-level Rocinante ship and its accompanying stages. The Expanse unfolds across a colonized galaxy 200 years in the future, when two strangers — hardened detective Joe Miller (Thomas Jane) and rogue captain James Holden (Steven Strait) — become unwittingly swept up in a vast conspiracy. Based on the New York Times bestselling book series collectively known as “The Expanse,” written by Daniel Abraham and Ty Franck (under the pen name James S. A. Corey), The Expanse also stars Shohreh Aghdashloo, Dominique Tipper, Cas Anvar, Wes Chatham and Frankie Adams. Season 2 of The Expanse is set to premiere Wednesday, February 1 on Syfy. Season 1 is available now via on demand and on Syfy.com, and on Amazon Prime (starting December 21). Syfy has announced the Season 2 premiere dates for both The Magicians and The Expanse, two of the most intriguing series from the channel in a while. Season two of The Magicians will premiere on Wednesday, January 25 at 9/8c. Based on the bestselling novels from Lev Grossman, Syfy’s hit drama The Magicians centers on Quentin Coldwater (Jason Ralph) and his 20-something friends as they discover their magical abilities at Brakebills University, a secret grad school specializing in magic. While there, they come to the realization that the fantasies they read about as children are all too real, and unwittingly invite a malevolent entity from the other side into their lives. Heading into Season 2, this group of unlikely heroes have been thrust into even more dangerous and unfamiliar territory, and must draw upon their novice skills to defeat a threat that could destroy the magical world itself. Driven by power, revenge and survival, they learn that those who entered the hauntingly beautiful world of Fillory will never be the same as those who leave. Season two of The Expanse will begin with a double episode on Wednesday, February 1st at 10/9c. The story of The Expanse unfolds across a colonized galaxy 200 years in the future, when two strangers – a hardened detective, Joe Miller (Thomas Jane), and a rogue ship’s captain, James Holden (Steven Strait) – become unwittingly swept up in a vast conspiracy to cover up a horrific human experiment. As Season 2 kicks off with interplanetary tensions at an all-time high, the cold war between Earth and Mars is on the brink of an all-out battle. The series is based on the New York Times bestselling book series collectively known as “The Expanse,” written by Daniel Abraham and Ty Franck (under the pen name James S. A. Corey). In an interesting development this weekend, Emmy winning actress Shohreh Aghdashloo (The Expanse, House of Saddam) is reported to be the High Command of the Federation for reshoots taking place for Star Trek Beyond, being directed by Justin Lin. The reshoots are not expected to affect the release date, which is July 22nd. It sounds like some last minute improvements or replacements to scenes are taking place.